Cadance Collective will be presenting a full program of original works as part of Carroll University’s Arts Weekend. Cadance Collective is once again joining Milwaukee Opera Theatre and Quasimondo Physical Theatre for the award winning production of Zie Magic Flute. Papagena on roller skates, a giant snake, and a strolling cellist are among the many wonderful things you’ll see in this re-telling of Mozart’s classic opera. Come hear the rarely performed Three Meditations by Leonard Bernstein, originally written for Mstislav Rostropovich and based on music from Bernstein’s Mass. Also on the program is Bruch’s Kol Nidre, Six Israeli Melodies arranged by Joachim Stutschewsky, and several art songs by Bernstein and Copland, sung by mezzo-soprano Emily Fons, and featuring Charles Q. Sullivan on piano. The recital will be in the acoustically and visually stunning chapel at Saint John’s on the Lake. Admission is free. Opening the newly renovated Stackner Cabaret, this one-woman tour-de-force show reminds us that everybody has a story – and a song – worth hearing. Share in the life-changing encounters between legendary divas and the everyday women whose lives they touched, interspersed with the songs that made Judy Garland, Patsy Cline, Edith Piaf, Billie Holiday, and Maria Callas icons of our age. Featuring such favorites as “Come Rain or Come Shine,” “Amazing Grace,” “Non, Je Ne Regrette Rien,” “Ain’t Nobody’s Business If I Do,” and “Vissi d’arte,” Songs for Nobodies shows us the magical power of song. Ticket information and showtimes can be found here. Alicia once again joins forces with an incredible actor to take on An Iliad. This time, it's different. The Poet is played by the phenomenal Emily Trask, putting a different perspective on the oldest war story known. This will take place at the beautiful recital hall on the campus of Hope College in Holland, MI, as part of Hope Summer Repertory Theatre's 47th season. Directed by the new Artistic Director of the company, Lenny Banovez, with sound design by Josh Schmidt, it promises to be a play that sticks with you for years to come. Dates and tickets can be found here. Come join Camerata Milwaukee for an evening of baroque music, where we will be performing works by Doemming, Fux, Purcell, and Vivaldi, featuring violist Nicolò Eugelmi. Join Cadance Collective in this open rehearsal as part of Kenilworth Open Studios. Observe us in our element, creating new work for the stage using musical instruments and moving bodies! 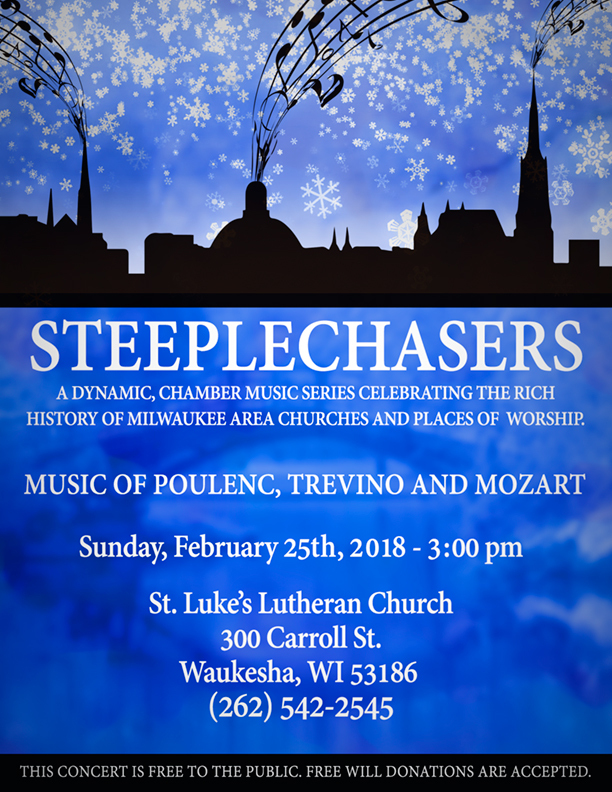 This fantastic chamber music series continues with a winter concert of Poulenc, Trevino, and Mozart. FREE and open to the public. Riso once again returns to Grace Lutheran for their popular First Fridays at Five series. They will be performing two rarer gems of the piano quartet repertoire. First on the program is Croatian composer Dora Pejacevic's Piano Quartet in D minor, followed by Russian-born Swiss composer Paul Juon's stunning Rhapsody for Piano Quartet. This concert is free! 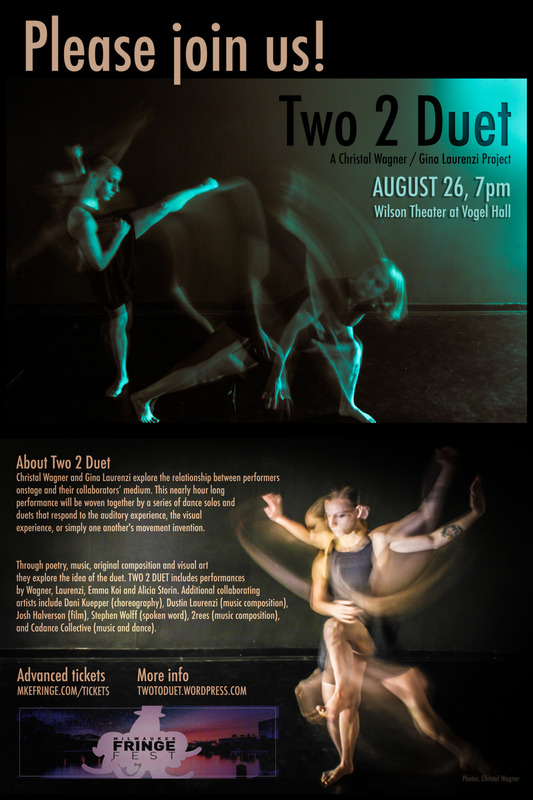 Cadance Collective will appear in Two 2 Duet with Christal Wagner at the 2017 Milwaukee Fringe Fest. Riso Quartet is closing out their season with a program of highly Romantic Slavic composers. Our program opens with the first movement of Croatian composer Dora Pejčević's little known but stunning Piano Quartet in D Minor. Next is Paul Juon's sweeping Rhapsodie for Piano Quartet, a highly programmatic piece inspired by the novel Gösta Berlings Saga by Selma Lagerlöf. The program will close with Antonin Dvorak's Piano Quartet in E flat Major. A donation of $5 at the door is requested to help defray the costs of producing and presenting a program of live music. The Riso Quartet is collaborating with clarinetist Orlando Pimentel and violinist Ernest Brusubardis IV to perform works by Kókai, Prokofiev, and Schubert. Hungarian composer Rezsõ Kókai's Quartettino for clarinet, violin, viola, and cello opens the program. Next is Prokofiev's rarely heard gem, Overture on Hebrew Themes, for clarinet plus piano quintet. Schubert's magnificent string quartet, Death and the Maiden, closes out the concert. Admission is free. The Riso Quartet is collaborating with clarinetist Orlando Pimentel and violinist Ernest Brusubardis IV to perform works by Kókai, Prokofiev, and Schubert. Hungarian composer Rezsõ Kókai's Quartettino for clarinet, violin, viola, and cello opens the program. Next is Prokofiev's rarely heard gem, Overture on Hebrew Themes, for clarinet plus piano quintet. Schubert's magnificent string quartet, Death and the Maiden, closes out the concert. Come out for an evening of fine wine and romantic masterpieces with the Riso Quartet and special guest Ernest Brusubardis IV on violin. A wine tasting begins at 6 p.m. followed by the concert at 7 p.m. The program will begin with Rachmaninoff's stunning Trio Elegaique no. 1 in G minor. Next is Turina's Piano Quartet in A minor, a lush and wild Andalusian journey. The program will close with Schubert's great Death and the Maiden string quartet. Tickets are $12 for PHA members and $15 for non-members. Cadance Collective is collaborating on Milwaukee Opera Theater's production of Zie Magic Flute, along with Quasimondo Physical Theater. The three performance companies are creating a re-telling of Mozart's iconic Magic Flute like you've never seen it before. Performances are taking place the stunning Tripoli Shrine Center atrium. Riso is returning to Grace Lutheran's popular Friday night concert series for their 2016 season. Works by Turina, Dvorak, and Sibelius. Free admission. 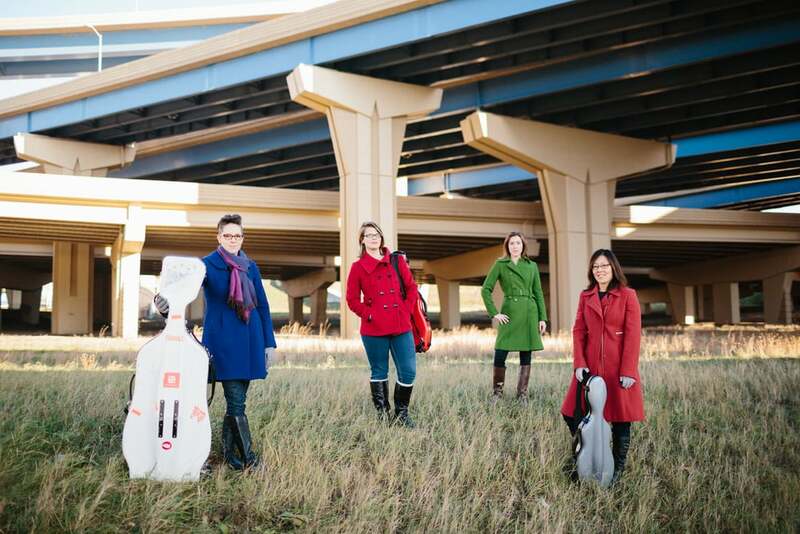 Riso Quartet is featured on the 2016 'Arts at the Waelderhaus' series where they will be presenting their Fall program at the beautiful, historic Waelderhaus in Kohler, WI. The program includes the Serenade from the Spanisches Quartett, Op. 11 by Louise Héritte-Viardot, the Piano Quartet in A minor, Op. 67 by Joaquin Turina, and the Piano Quartet No. 2, Op. 87 in E-Flat Major by Antonín Dvorák. Suggested donation $5. Riso will be presenting a free preview of their Fall 2016 program including the Turina Piano Quartet and Dvorak Op. 87 Piano Quartet in E-Flat Major. This recital will feature women composers of the past and present. The program consists of songs by Isabella Colbran, Pauline Viardot, and Jane Vieu as well as the following works by living composers: Essex Songs by Gilda Lyons featuring Alicia Storin on cello, I Never Saw Another Butterfly by Lori Laitman, and the premiere of Birds of Peace by Gwyneth Walker. Come on out to the Monarch Ensemble's first full length recital for an afternoon of both favorites and musical gems, including Grieg's Lyric Pieces, Op. 12, the energetic Quatour Parisienne, by Charles Fernandez, and the aria from Bach's Cantata 175 with special guests. The performance is free and a reception will follow the event. Experience chamber music the way it was originally performed--up close and personal. To that end, we are going to be moving our audience seating onto the stage so you can be right there with us as we navigate through Brahms and Bridge, among other selections. Find out more at Riso Quartet's website. Riso Quartet is part of the 14th annual WISN Channel 12 holiday special 'Season to Celebrate.' Join us for a full hour variety show featuring music and dancing from your local performing artists, all filmed at historic south eastern Wisconsin locations. We had the great privilege to perform at the beautiful Waelderhaus in Kohler and use their stunning Steinway. Our pianist, Johanna Schilling, created an engaging arrangement of a Spanish carol from the 1850's, A La Nanita Nana, and all four of us collaborated on an arrangement of the classic, It Came Upon a Midnight Clear. Tuesday, December 22, 7 p.m.
Thursday, December 24, 11 p.m.
Thursday, December 31, 10:30 p.m.
Christmas with Lakeshore Chorale & Youth Chorale is always a magical part of the Holiday season. Join us for an afternoon filled with the beautiful colors of Christmas – music to celebrate this special time of year. Repertoire included: “O Yule Full of Gladness” arr. by Carolyn Jennings. “O Come, O Come, Emmanuel” by Barlow Bradford, “This Little Babe” by Benjamin Britten, and others. United Methodist Church of Whitefish Bay presents "Believe"
Come experience the magic of Christmas as UMC-WFB's Christmas Celebration, "Believe." More than 150 participants will offer music, poetry, scripture, liturgical dance, and drama. We invite you to come and enjoy the glorious sounds of choirs, handbells, and orchestra in this inspiring musical event. The 90-minute program will feature John Rutter's "Gloria,” a nativity with live animals and more than 40 angels hovering above the manger in Bethlehem. Children and adults of all ages are sure to laugh, sing, and celebrate the reason for the season. Tickets available now, $10 for adults and $5 for children. "It’s high time we once again enjoyed “An American Christmas” at the Philharmonic. And, in our tradition, we’ll be joined by one of Waukesha County’s finest high school concert choirs. Chock full of Holiday favorites, both sacred and secular, this concert will also present Chapman Piano Competition winner John Schindler, o [Star-Wars] ne of the finest such talents we’ve ever heard! And, in a salute to the release of the latest installment of George Lucas’ Star Wars saga, you’ll hear a stunning suite from the unforgettable original film."